To fall head over heels in love in – or with - Canada's largest city, head to these one-of-a-kind sweet shops. Nothing inspires love like artistic chocolates, a giant donut cake, or gourmet cinnamon buns. If high concept design gets your heart pumping, the splashy, graphic CXBO chocolates (above photo by Ryan Crouchman) are your perfect confectionary match. 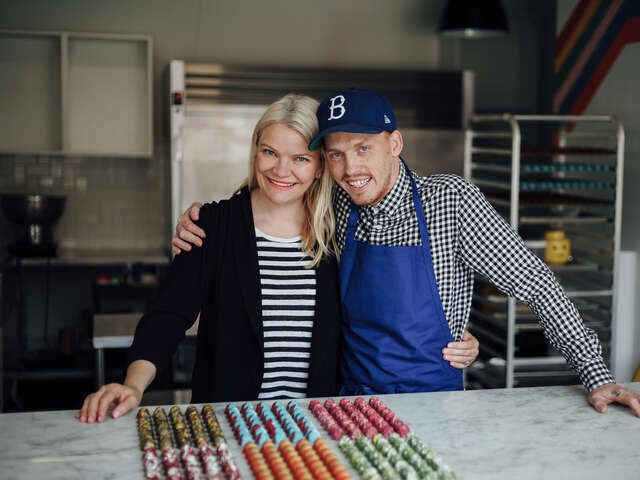 Chocolates By Brandon Olsen were a surprise to the Toronto culinary scene when they launched in 2016. Until then, the now-chocolatier had been best known for his flair with nose-to-tail cuisine, and pop-up fried chicken. But there was chocolate in his heart. In collaboration with his fiancée, artist and filmmaker Sarah Keenlyside, CXBO took flight. She says art chocolates are a natural extension of their relationship. Chef Olsen's chocolates are equal parts playful and architectural. The 'paint splash' finish on polyhedron chocolates makes them the gems of the chocolate world. Inside, uniquely creative flavors like Orange Blossom & Honey and Raspberry Rose Fennel rub elbows with exquisitely true-tasting classics like Cherry & Vanilla and Salted Caramel. There are seasonal and custom collections too, like the 'Love Boat' Valentine's Day collection (below). You can buy CXBO at their College Street West shop or at a few stores around the city, including the hipster Drake Hotel. To double down on your immersion into Olsen's culinary arts, dine at their restaurant La Banane, which opened in January 2017 and is already at the top of the list of 'hottest restaurants in Toronto'. 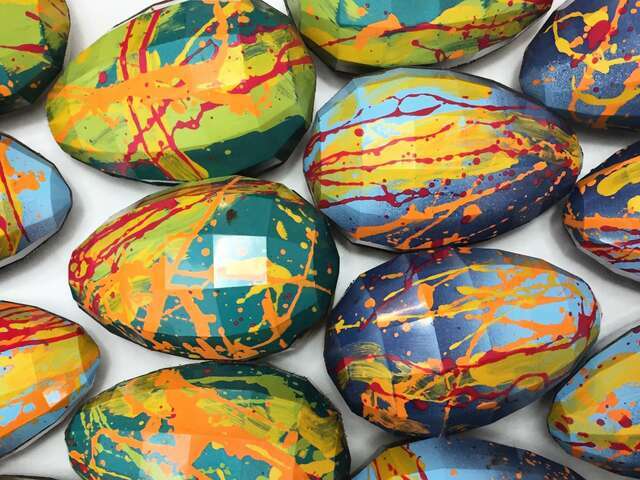 A nearly plate-sized chocolate "Ziggy Stardust Disco Egg" (below) is the star dessert. 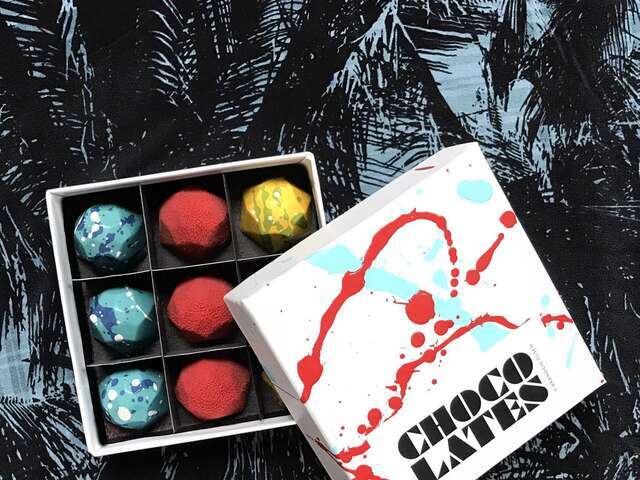 Tip: you can order the currently available collections online so even after you leave Toronto, you can still get your fix of these exquisite edible art chocolates. 'Home is where the heart is'. But Rosen's Cinnamon Buns is a good place to look next. 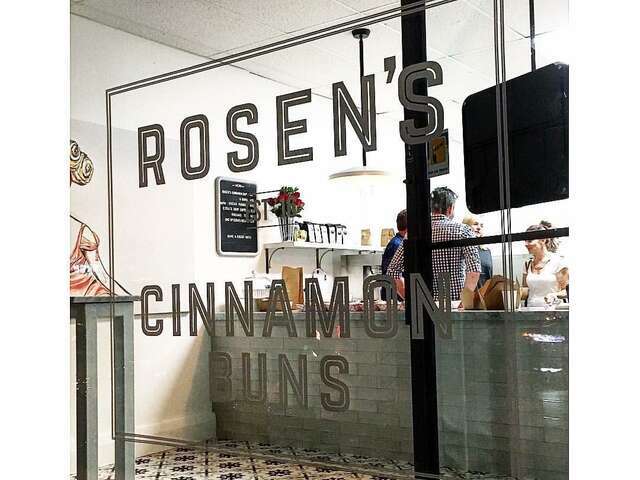 Amy Rosen, the acclaimed food writer, arbiter of the best restaurants, and cookbook author, launched Rosen's Cinnamon Buns after a revelation: everyone loves cinnamon buns. The proverbial light bulb switched on at a family gathering: when she served her cinnamon buns, the whole room, from the old to the young, the tall to the small, fell silent in homage to what may be the most deceptively simple pastry. She opened the shop (there's a bar but no seats) in trendy College St. West in 2016. Except for tea and coffee sourced from local Toronto businesses, the cinnamon bun is the only product sold. Don’t even dare to compare it with the cloying fast food mall version or… worse, the canned refrigerator variety! 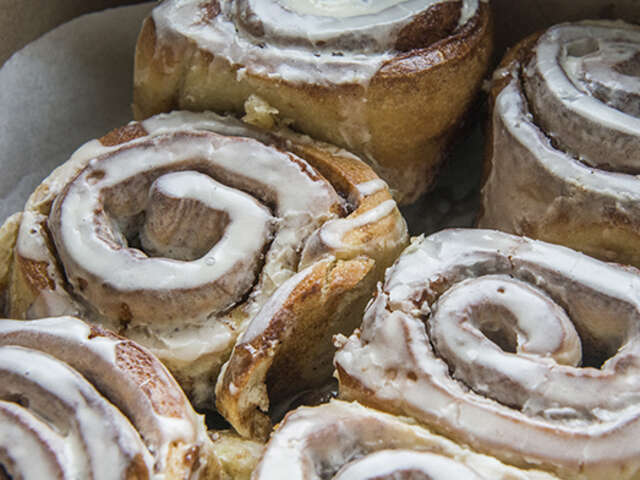 Rosen's cinnamon buns are all natural, made with locally sourced where possible, organic and premium ingredients. The base is a yeast dough, with a familiar, yet complex – and secret - combination of spices in the gooey centre. And was Rosen right that everyone loves cinnamon buns – enough to commit a whole store to them? Tip: Get lucky with your timing and you might arrive when an occasional pan of cinnamon bun bread pudding comes out of the oven. How sweet do you like your sweets? The 'injector' donuts at The Rolling Pin pastry shop let you take charge in your love affair with pastries. 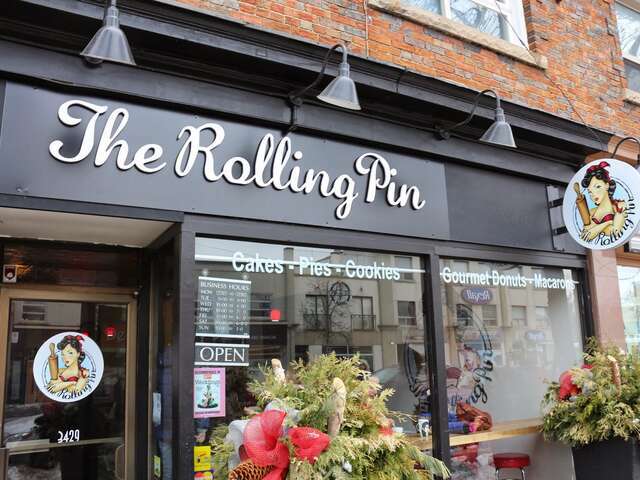 In the Lawrence Village area along Toronto's famous Yonge Street, pastry school besties Vanessa Baudanza and Isabelle Loiacono launched The Rolling Pin in 2014. There's a fun, vintage vibe, from the cheeky 1950's signage, to the café inside with its mid-century decor and pops of cherry red. The Rolling Pin menu features freshly baked selections of all the latest bakery/ pastry favorites, from macarons, cupcakes and cupcake 'bouquets', to cookies, pies, wedding and specialty cakes. But it's the humble donut that has become their calling card. 'Ever wonder what a $10,000 donut tastes like?' they ask. The donut duo recently won Food Network's 'Donut Showdown', and it's that prize-winning yeast donut recipe that is baked daily in different flavors. You can even order any of the donut flavors as a giant, decorated 10-inch 'Donut Cake'. 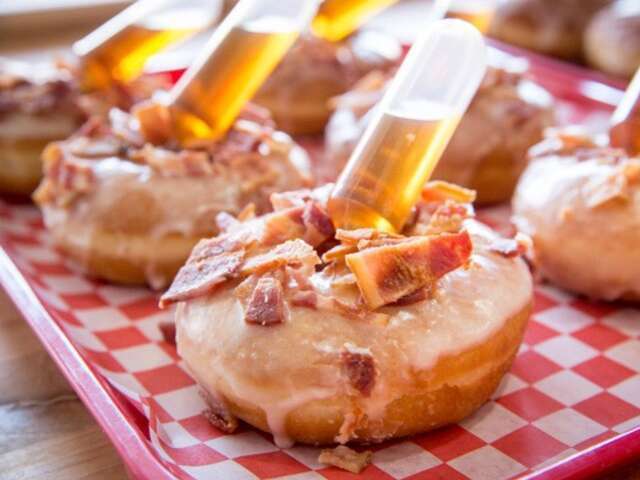 But The Rolling Pin donut that truly 'takes the cake' is the one-of-a-kind 'injector' donut, and especially the maple bacon flavor with the injector tube of extra maple syrup, because… maple syrup. It puts you in the power seat of your romance with the ultimate Canadian flavor. If you want a little bit more maple syrup, or a little bit less, you do it yourself and get exactly what your heart desires. Tip: Check their web site for the 'weekly donut schedule' before you go so you don't miss the one you've got your heart set on!